RBC Retirement Portfolios offer a choice of seven retirement portfolios and the RBC Retirement Income Solution designed to meet the needs of different investors throughout their investing lifetime. By keeping your expected retirement date in mind, RBC Retirement Portfolios can help take you to – and through – your retirement. 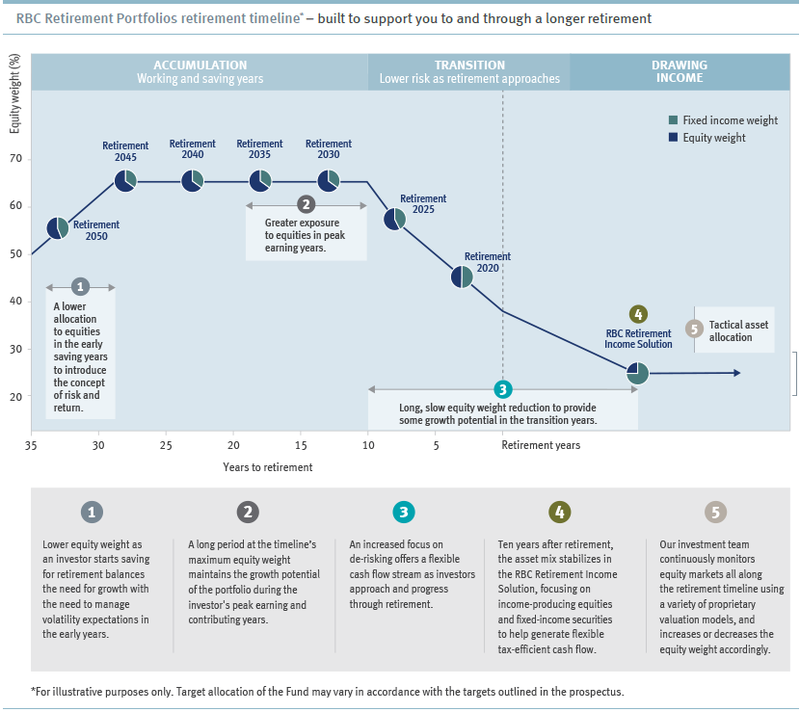 The asset allocation of the Portfolios is based on a unique retirement timeline that combines our investment management expertise with behavioural finance research. The information provided is not intended to provide specific financial, investment or income tax advice and should not be relied upon in that regard. Please consult your advisor and read the prospectus or Fund Facts document before investing. There may be commissions, trailing commissions, management fees and expenses associated with mutual fund investments. Mutual funds are not guaranteed, their values change frequently and past performance may not be repeated. RBC Funds, BlueBay Funds and PH&N Funds are offered by RBC Global Asset Management Inc. and distributed through authorized dealers.